Spicy Buffalo Chicken Dip is a 5 ingredient recipe and takes less than 30 minutes to make! Perfect for a Super Bowl party or any kind of get-together. 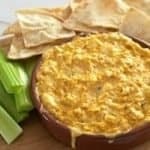 This chicken dip recipe was supposed to be part of a wonderfully happy time in my life, where I would be anticipating the upcoming Super Bowl 50 and getting ready to cheer on my favorite team, The New England Patriots. Instead, my Pats aren’t in it so now I could really give two hoots about the big game and don’t care at all about watching it. 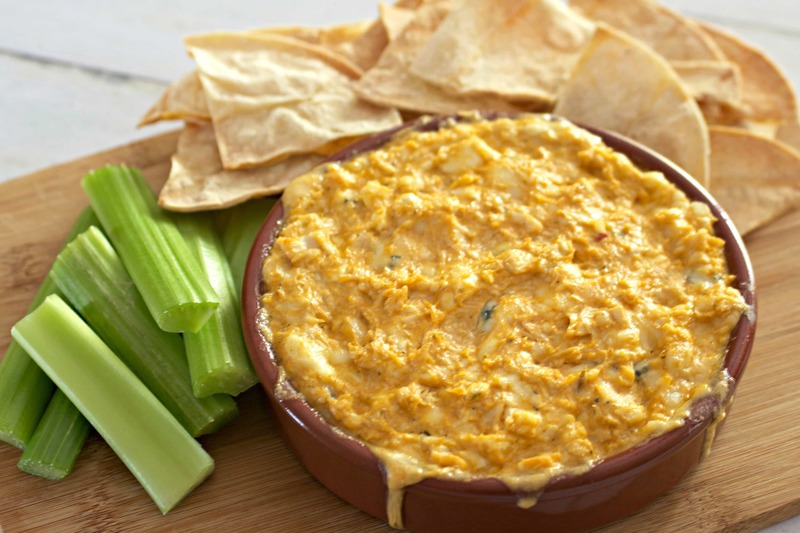 I may even have my own anti Super Bowl party where I can make this dip and drown my sorrows in each bite of spicy goodness. It’s way easier (and less messy) than eating buffalo chicken wings too! I usually pair this spicy food with homemade baked tortilla chips and celery, but you can also serve it with carrot sticks, cucumber rounds, red bell pepper slices, pita chips, and even pretzels. Delicious and easy, make this Spicy Buffalo Chicken Dip for your Super Bowl party or your “I’m not watching that damn game” get-together. Either way, it’s a yummy addition to your next gathering of family and friends. 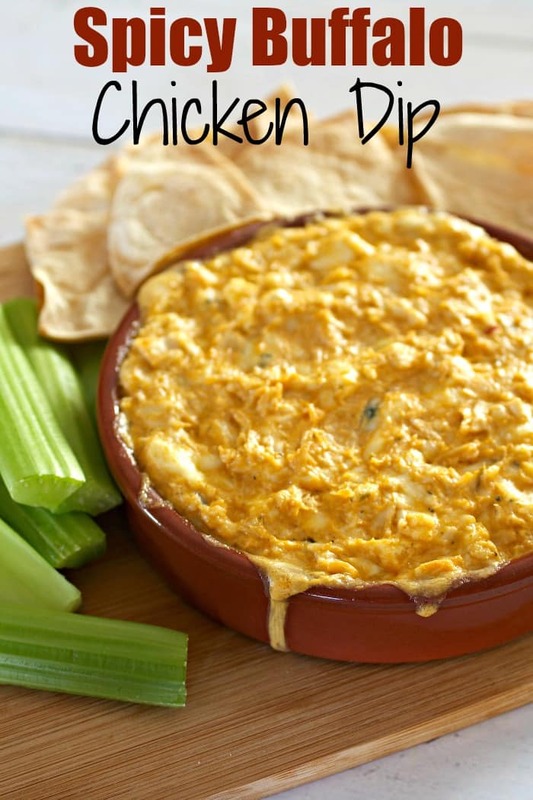 Don’t forget to share this chicken dip if you LOVE it and thank you! Spicy Buffalo Chicken Dip is a 5 ingredient recipe and takes less than 30 minutes to make! Perfect for a Super Bowl party or any kind of get-together with family and friends. Girrrl, you better step off! Don’t be callin’ my Patriots stupid and your BFF card is getting real close to being revoked! lol! Even when I move to NC, I can’t root for the Panthers and definitely not while Cam is there (that goes back to when he played for Auburn & I’m Univ of Tn, so we will always be enemies). At least you agree with me on eating this dip for dinner! Be forewarned, I’m bringing all my Pats shirts (and ballcaps) when I move to NC. Thank you Beeta and I’m so glad you don’t care either. If we live closer to each other, we would do a spa day instead of watching this dumb Super Bowl This dip with a salad and a beer is totally a well rounded meal! This dip is so yummy and so easy to make! Perfect recipe for the Super Bowl! Although I don’t watch football much, I do cheer on the Patriots every now and then. And when they are at the Super Bowl, it’s a must watch. Like you Karrie, I couldn’t care less who wins this year. The only part I’ll be watching is halftime! What I can get into is this luscious dip! So cheesy, spicy, and warm. Oh yeah! I can see myself chowing down on it as I support you in your anti-Super Bowl sentiment come game night! The Super Bowl is so much better (and easier to watch) when your team is it in. I’ll be watching halftime too and eating a bunch of snacks! Oh my goodness, I just want this dip, a bag of chips and some alone time!!! hahaha But, maybe I should share it with friends over the big game. Delicious! Karrie! I love everything about this dip! I mean come on! you can’t go wrong here!! hahaha I am cheering for Cheyanne’s home town team too! so join us already! hugs! Oh man… Imagine having this next to a ROUDY crowd… And they flip out over a football play and BAM… Dip on floor! I would hoover it off the floor for you! Darn about your team! I always watch the game for the commercials…..and the food! This dip needs to be on my menu for the very small party we will have! I hear you Kathy and thanks for the sympathy. I think I’ll watch the commercials too…and halftime, but that’s it! First time in my life I when heard about Super Bowl was when Michael Jackson (who I love) performed during the halftime show in 1993. I haven’t learnt anything else about the game since then so I can not afford to have an opinion on this but I do have an opinion on that cheesy golden bowl of yours. It looks so yummy <3 I love everything you put in it so I am sure it’s „wow”. Thank you so much Simona and I love Michael Jackson too! He was such a great performer. This dip looks absolutely delish, Karrie! Confession – I know pretty much nothing about football (the teams or the rules of the game). However…..I’m all about all those yummy foodball/superbowl recipes that float around this time of year so I would gladly watch a game while eating this dip!! I could totally eat all of this myself!! Thanks Dawn and I’m all about eating food at the foodball. hahaha! I actually like the term foodball and think we should make that a game in itself. Oh, and I mean ‘football’, not ‘foodball’….hahahaha…wonder what’s on my mind!!! 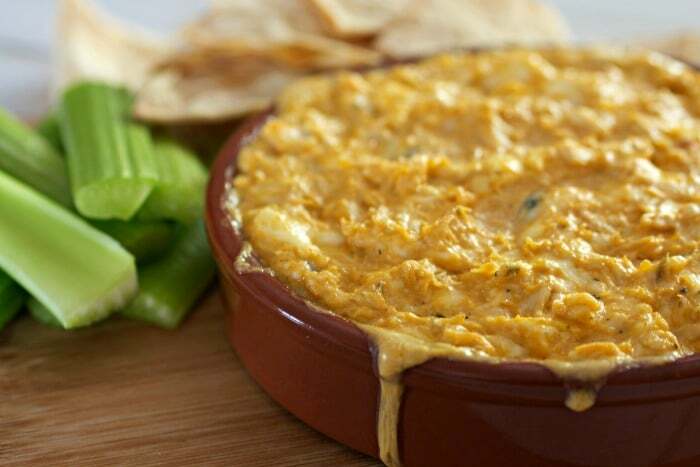 My guys will love this dip for the big game day. Great recipe! Hahahaha Connie! Oh man, I wish I would have thought about that quote and put it in the post ’cause that’s a great one. Mama’s right too! This dip is great for game day snacking! I love anything buffalo style! Me too Jen! I love buffalo style anything and everything. Yeah… I couldn’t care less who’s in the game – I just like to eat and drink… is that bad? So no Super Bowl party is complete without an awesome dip, and this most certainly fits the bill! Forget the game, I’m hoarding this bowl and all the chips and retreating to a quiet corner to stuff my face! Awesome recipe girl! Me too Kathleen! Eating and drinking is what I’m going to be all about on Super Bowl Sunday. This dip looks so creamy and delicious. Going to try this weekend ! Thanks Kushi and let me know how it turns out for you! Ben, there is no such think as bad manners when a spoon and a buffalo chicken dip is involved! hahahaha! I could live on Buffalo Chicken dip!! Love that you used pepper jack — its one of my favs!! Need to make soon!! I could seriously live on it too. Let me know how you like when you make it.